Cette unité spacieuse est l'endroit idéal pour se détendre, profiter de la plage ou jouer quelques-uns des meilleurs terrains de golf en Caroline du Sud. Tout en profitant de la vue depuis votre balcon donnant sur le magnifique océan Atlantique. Notre condo est situé à quelques pas des plus belles plages de Litchfield avec des dunes prestine. Cette unité bord de l'océan avec une vue imprenable sur l'océan et la piscine a un kiosque de couverture. La cuisine est équipée de nouveaux comptoirs en granit, cuisinière, réfrigérateur et micro-ondes, machine à glaçons. Grande salle familiale ouverte est spacieuse avec une grande salle à manger. Cette zone a une vue imprenable sur l'océan. La chambre principale a un lit king size avec un accès séparé au balcon. taille belle salle de bains principale avec douche et baignoire jacuzzi. La deuxième chambre a un lit queen size, de parquet, salle de bains privative et d'une télévision. Troisième chambre a des lits superposés et peut accueillir quatre personnes avec salle de bains privative et d'une télévision. Surface habitable a une taille queen lit gigogne (dort un ou deux). Accès complet à internet wifi dans toute copropriété. Les sols sont magnifiquement entretenus, des courts de tennis, des pistes cyclables et pêche à proximité. Starbucks est située sur un terrain avec centre de remise en forme, Location de vélos tous payants pour des motifs. Great stay, Condo was everything we had hoped for. We had a great time with family, everything we needed to make for a great vacation. Thank You for joining us again this year! I hope that you all enjoyed yourselves and found everything you needed. The condo was beautiful, clean and has everything you need - including amazing ocean and pool views. Great location and the owners are so easy to work with and are very responsive. 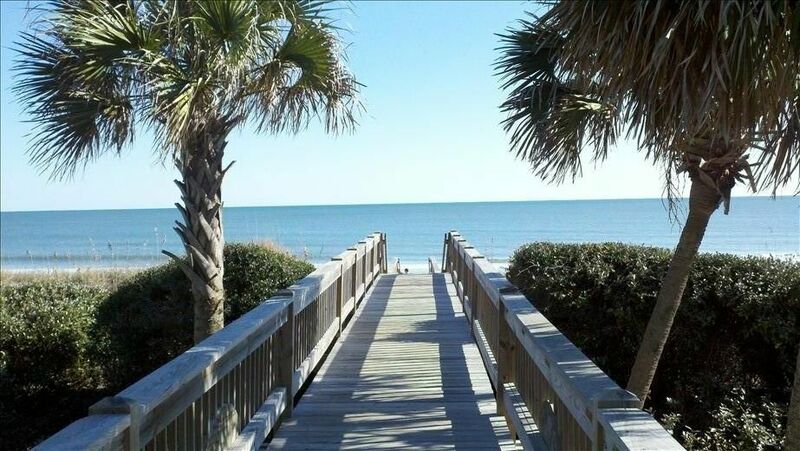 I would absolutely recommend this condo for your stay at North Litchfield beach. We had 2 adults and 3 teenage children with us and had more than enough room. Don’t hesitate to book this condo! It’s fantastic! We are glad that your family had a great experience. Thank You! Thank You for the kind comments we always try our best! The beach was gorgeous and the grounds very well maintained. The unit nicely accommodated our family - 3 adults and 2 adult children. Would have been nice to have beach chairs since we traveled in by plane so unable to bring our own. Owner was extremely responsive and we enjoyed our stay. We loved staying at this beach front condo for the week with our three kids. Beautiful view from the second you walk in the door. Lovely terrace. The beds were very comfortable. Kitchen had everything we needed. Love that the linens were provided and having a washer/dryer in unit was wonderful with traveling with small children. Our kids loved the pools and the sand toys (although minimal) kept them entertained at the beach. We also enjoyed walking down the complex to the fishing area in the evening. Would definitely stay here again! Thank you so much for sharing! It was a lovely off season visit. The view was really nice - easy walk to the beach. The house is furnished very comfortably and the kitchen is well furnished, easy to cook in for our visit. We are glad you enjoyed yourselves and found the place comfortable.